This emerging field focuses on food and supplements’ value in healing the mind, body, and spirit to promote optimal health. Conventional medicine might treat depression with a range of prescription drugs from Abilify to Zoloft. What’s now widely termed complementary and alternative medicine (CAM) might treat that same patient with depression using herbal or dietary supplements, such as St. John’s wort or omega-3 fatty acids. The rapidly growing field of integrative medicine seeks to combine the best of both worlds—appropriate components of conventional medicine and CAM—to help patients achieve optimal health and wellness. It shouldn’t come as a surprise to dietitians, but nutrition plays an important role in integrative medicine and has spawned a relatively new field that blends the use of food and supplements to promote optimal health and help treat disease. Sometimes called holistic nutrition or integrative nutrition (which is a trademarked phrase of a commercial school for training health coaches called the Institute for Integrative Nutrition), this amorphous discipline is becoming more popular as it focuses on how diet and supplementation may contribute to the wellness objective of healing body, mind, and spirit. Food and supplements aren’t meant to replace traditional medicine and dietitians aren’t physicians, but RDs should understand how this emerging area might help their clients and consider how to incorporate it into their professional lives. There really isn’t a formal definition of this burgeoning discipline because the field can encompass several different modalities. The food and nutrition component of integrative medicine shares the philosophy of focusing on the whole person. It’s not just about eating the recommended number of fruits and vegetables each day or counting calories. Instead, it looks at ways to heal the whole person through food, vitamins, minerals, and dietary and herbal supplements—working in conjunction with conventional medicine as appropriate. Dietitians must first grasp the concept of integrative medicine, which has been around for many years but only recently has begun to receive more recognition as people look for alternative ways to heal the body and prevent disease. 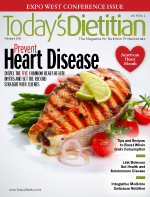 This article provides an overview of nutrition’s growing role in integrative medicine; examines nutritional therapies related to migraine headaches, depression, and inflammatory diseases; and provides RDs with strategies they can use to counsel clients more effectively. To fully appreciate integrative medicine, RDs need to understand two terms: conventional medicine, and CAM. Conventional medicine usually is what patients encounter when they visit a hospital, physician’s office, or clinic. It encompasses high-tech procedures, surgery, and pharmaceuticals to treat health conditions and diseases. Alternative medicine can include unconventional healing modalities ranging from acupuncture, aromatherapy, biofeedback, and reflexology to healing touch. The combination of alternative therapies and conventional medicine is considered CAM. In its simplest form, however, CAM is anything used alternatively to conventional medicine, so it’s extremely broad in scope. • Food-mood connection: Many studies have examined how specific foods, whole-food supplements, or both can affect depression, irritability, emotional eating, and behavior.2-5 Other studies have shown that a diet consisting of fruits, vegetables, and healthful fats can alleviate depression and decrease irritability among the elderly and adolescents compared with a diet high in processed foods and sugar. • Diet trends: These can include all the different fad diets that flood the marketplace each year, such as the Paleo and raw food diets. To counsel clients successfully, RDs must learn about these trends, understand and explain why they may or may not work, and know how to effectively relay this information to clients. • Antioxidants and phytonutrients: While antioxidants play a role in integrative or holistic nutrition, dietitians need to dig deeper to understand the whole-body philosophy. They must understand antioxidants and phytonutrients at the cellular level and how they relate to gene expression. For example, which antioxidants turn genes on or turn them off and what effect does this have on the body. Exploring the synergistic effect of multiple food nutrients also fits into this equation. A dietitian’s role may include candid discussion on food sustainability, food production methods, buying local food, organic vs. conventional farming practices, genetically modified foods, food marketing, and food labeling. Many of these areas include political and social debate that RDs may want to consider as they help guide clients’ food decisions when treating the whole body. When developing a plan for clients interested in integrative or holistic nutrition, it’s important for RDs to remember the integrative medicine philosophy of treating the whole person. No one plan fits all clients, and their emotional, physical, and nutritional needs must be addressed when developing a plan. Clients may have many issues in common, but the level of RD-client discussion, goal setting, and the path to achieving them will differ from individual to individual. RDs should conduct an initial assessment that involves taking a thorough medical history and evaluating the client’s medications, including those sold over the counter as well as supplements. They should inquire about current and past food habits; lifestyle patterns involving food, work, and play; the emotional component of the client’s relationship with food (whether it’s “eat to live” or “live to eat”); ask about the client’s support systems and family dynamics; and whether the client has any food or medication allergies. Moreover, dietitians should consider using evidence-based treatments, vitamin and mineral supplements, the anti-inflammatory diet, and herbs. The use of evidence-based treatments has become a more precise way to diagnose, assess, and treat health conditions. Many maladies can benefit from an evidence-based nutrition approach (eg, pain management, gastrointestinal health conditions, autoimmune diseases). Two of the more common ailments that may benefit from an evidence-based nutrition approach are migraine headaches and depression. People commonly seek treatment outside of conventional medicine for these chronic problems. Caffeine, refined sugars, and foods containing preservatives such as monosodium glutamate (MSG) or artificial sweeteners, including aspartame, neotame, saccharin, sucralose, and acesulfame-K can cause migraines. To identify food triggers, encourage clients to keep a headache-food journal to determine which foods may be causing the migraines. They should record when the food was consumed and if and when a headache follows. The client also should note the severity of the headache, since it might have been triggered by the amount of a certain food eaten vs. the food itself. Once the RD recognizes a pattern, the client can begin to eliminate those foods to determine which item is the culprit. Other causes of migraines include low blood sugar, sudden increases in blood sugar over a short period of time, sinus congestion, and sinus infections. One technique to reduce the occurrence of migraine headaches is to keep the sinus cavity free of bacteria by irrigating the nasal passages with a neti pot. Another possibility is using the herbal supplement feverfew, which has been shown to reduce the severity and frequency of migraine headaches because of its antibacterial and anti-inflammatory properties. Because it’s available in several forms (eg, dried leaves, fresh leaves, tinctures, capsules), dosing depends on which form a client uses. A typical dose in capsule form is 50 to 100 mg up to three times daily. When recommending herbal supplements, it’s important for RDs to know the contraindications and possible drug interactions of any medications clients are taking. Although the complexity of depression warrants the use of therapies outside the realm of nutrition, such as psychotherapy, medication, and regular physical activity, nutrition plays an important role in regulating an individual’s emotions. Nutrients have a positive impact on the brain neurotransmitters norepinephrine, dopamine, and serotonin. Depending on the number of nutrients a client consumes, they can influence the quantity of neurotransmitters produced. RDs who counsel clients suffering from depression should ask them if they experience episodes of emotional eating since depression can cause it. Dietitians should continue this conversation throughout the treatment process. One way to help relieve symptoms of mild to moderate depression is to take vitamin and mineral supplements. Research has shown that omega-3 fatty acids, folic acid, S-Adenosylmethionine (SAMe), and B vitamins can play a role in regulating mood. • Omega-3 fatty acids: More and more studies are supporting the idea that omega-3 fatty acids can relieve symptoms of depression. A positive correlation exists between an insufficient (or deficient) intake of omega-3s or an unbalanced ratio of omega-3s to omega-6s in the body and an increased rate of depression.7 Research to determine the correct dosage of omega-3 fatty acid intake to alleviate symptoms is under way; however, current recommendations call for a minimum of 1 to 6 g/day, depending on the client and the severity of the depression. Flaxseed or flaxseed oil supplements are an adequate substitution for vegetarian and vegan clients. • Folic acid: Studies show deficiencies in folic acid are linked to depression.8 Decreased levels of folic acid lead to decreased levels of serotonin, the brain neurotransmitter that contributes to the feeling of well-being and happiness. In some cases, as little as 200 mcg (1 cup of cooked spinach) may be enough to help relieve minor depression, although 400 mcg up to 1 mg daily appears to be more effective. • SAMe: Many health professionals consider SAMe to be an effective, natural antidepressant. Because its positive effects can be apparent early on, SAMe is recommended in the nutrition therapy plan. Dosage should be tailored to the individual depending on the effects; however, starting at a dose of 200 mg/day is recommended. RDs can increase the dosage by increments of 200 mg as tolerated in divided doses. SAMe is more quickly absorbed on an empty stomach, although food won’t inhibit absorption, only slightly delay it. Many foods can cause inflammation that can manifest as chronic inflammatory conditions, such as arthritis pain (eg, rheumatoid, osteoarthritis), atherosclerosis, inflammatory bowel disease, and eczema. Therefore, RDs should encourage clients to reduce or eliminate foods with inflammatory properties and increase their intake of foods with anti-inflammatory properties. Foods that tend to cause inflammation are those containing refined sugar, saturated fat, trans fat, sodium, additives, and animal proteins. Anti-inflammatory foods include those made from whole grains or intact grains (eg, barley, quinoa, brown rice, millet, rolled oats), fruits, vegetables, those low in saturated fat and that contain omega-3s, plant proteins (eg, nuts, seeds, lentils, legumes), and unprocessed foods. The anti-inflammatory diet balances the ratio of omega-6 to omega-3 fats, which should be closer to 1:1. (Current sources suggest the Western diet has an omega-6 to omega-3 ratio closer to 15:1. )11 Decreasing the amount of omega-6 fats in the diet while increasing omega-3 fats will help balance that ratio and decrease the inflammatory response. Whether recommending herbal or vitamin and mineral supplements, it’s important for RDs to know how the supplements are absorbed and impact the body, and to consult with their clients’ physicians before recommending them or any aspect of an integrative plan. Dietitians should use supplements from only reputable sources because the supplements’ quality can influence tolerance and effectiveness. Moreover, dietitians need to know the contraindications and drug interactions associated with each supplement and be cognizant of how the nutritional treatments may affect patients with various other health problems. It’s also important to monitor patients for any side effects or adverse events. The nutrition specialty described as integrative or holistic is part of an exciting field, and research is progressing. RDs interested in this area are encouraged to learn about integrative medicine as a starting point and incorporate its philosophies into their specialty. The use of integrative techniques in pediatric nutrition is an area that’s especially growing. Researchers are examining integrative therapies in children with ADHD, autism, and obesity. So keeping current with research in these areas and others will become even more important as more nutrition professionals adopt the integrative principles into daily practice. — Melinda Lund, MS, RD, is a freelance nutrition writer and a medical nutrition therapist for a local hospital in southwest Missouri. • Winston and Kuhn’s Herbal Therapy & Supplements: A Scientific and Traditional Approach by Merrily A. Kuhn and David Winston: This pocket guide provides the essentials of herbal therapy and nutritional supplements. • Integrative Medicine by David Rakel, MD: This includes information on and recommendations for pulling integrative medicine ideas into nutrition. • Arizona Center for Integrative Medicine (http://integrativemedicine.arizona.edu): Founder Andrew Weil, MD, provides information about the center, nutrition’s role in integrative medicine, and resources for patients, students, and health professionals. 1. Rakel D. Integrative Medicine. 2nd ed. Philadelphia, PA: Saunders; 2007: 4-5. 2. Omega 3 fatty acids influence mood, impulsivity and personality, study indicates. UPMC website. http://www.upmc.com/media/NewsReleases/2006/Pages/omega-3-study.aspx. March 3, 2006. 3. Benon D, Donohoe RT. The effects of nutrients on mood. Public Heath Nutr. 1999;2(3A): 403-409. 4. Akbaraly TN, Brunner EJ, Ferrie JE, Marmot MG, Kivimaki M, Singh-Manoux A. Dietary pattern and depressive symptoms in middle age. Br J Psychiatry. 2009;195(5):408-413. 5. Jacka FN, Kremer PJ, Leslie ER, et al. Associations between diet quality and depressed mood in adolescents: results from the Australian Healthy Neighbourhoods Study. Aust N Z J Psychiatry. 2010;44(5):435-442. 6. Gearhardt AN, Yokum S, Orr PT, Stice E, Corbin WR, Brownell KD. Neural correlates of food addiction. Arch Gen Psychiatry. 2011;68(8):808-816. 7. Rocha Araujo DM, Vilarim MM, Nardi AE. What is the effectiveness of the use of polyunsaturated fatty acid omega-3 in the treatment of depression? Expert Rev Neurother. 2010;10(7):1117-1129. 8. Coppen A, Bolander-Gouaille C. Treatment of depression: time to consider folic acid and vitamin B12. J Psychopharmacol. 2005;19(1):59-65. 9. Rakel D. Integrative Medicine. 2nd ed. Philadelphia, PA: Saunders; 2007: 75-76. 10. Skarupski KA, Tangney C, Li H, Ouyang B, Evans DA, Morris MC. Longitudinal association of vitamin B-6, folate, and vitamin B-12 with depressive symptoms among older adults over time. Am J Clin Nutr. 2010;92(2):330-335. 11. Simopolous AP. The importance of the ratio of omega-6/omega-3 essential fatty acids. Biomed Pharmacother. 2002;56(8):365-379. 12. Kuhn MA, Winston D. Winston and Kuhn’s Herbal Therapy & Supplements: a Scientific and Traditional Approach. 2nd ed. Philadelphia, PA: Lippincott Williams & Wilkins; 2008: 194-196.